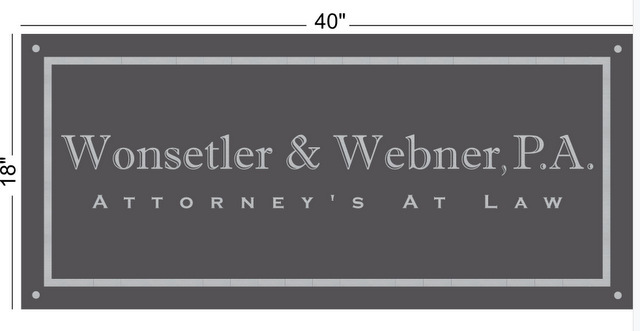 Custom Lobby Sign for Law Firm in Orlando FL! Do you have space in an office complex or strip mall? How do visitors know they have found the right suite? You may have exterior markers that help people find the place, but nothing welcomes clients and guests in better than lobby signs. 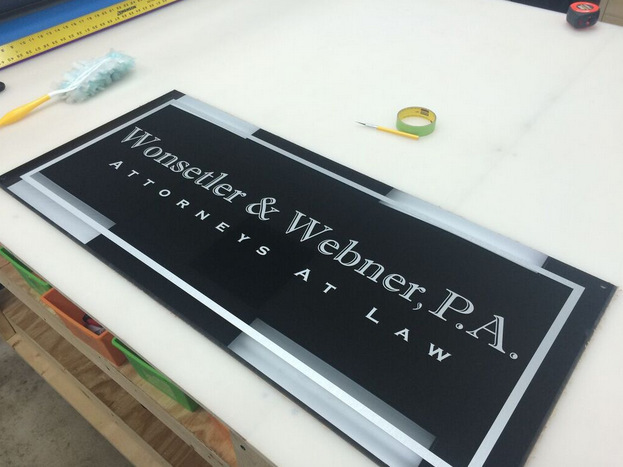 Wonsetler & Webner, PA realized this so they contacted Citrus Sign Studio for lobby signs for law firms in Orlando, FL. 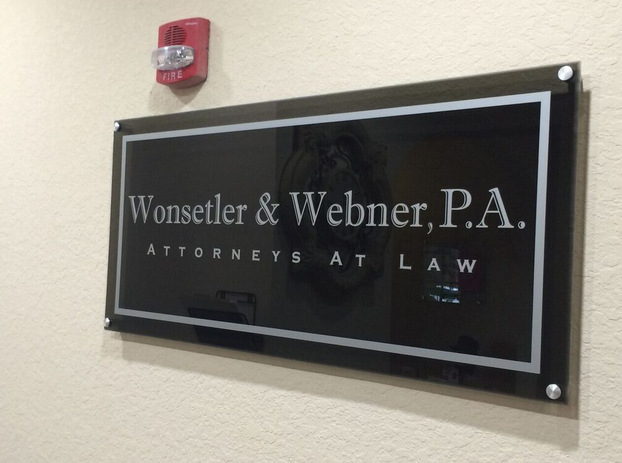 What Is Wonsetler & Webner, PA? 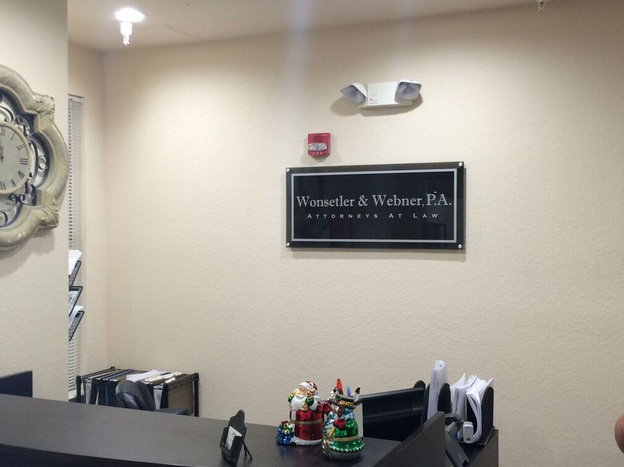 Located on North Orange Avenue in Orlando, Wonsetler & Webner, PA is the law office of Karen Wonsetler and Sarah Elizabeth Webner. It is a real estate law firm that has been providing knowledgeable legal representation and attentive services for over fourteen years. They offer representation in foreclosures, lease and purchase agreements, community associations, and tenant/landlord disputes. They have experience dealing with homeowners associations as well. We always offer design proofs! When an organization that is committed to helping local residents came to us for lobby signs for attorneys in Orlando, FL, we were more than happy to help out. Sarah recently became a partner in the law firm so it became necessary to change the branding from “Law Office of Karen Wonsetler P.A.” Part of this was updating their signage. Fortunately, we knew exactly what to do. After an initial consultation where we learned about what Wonsetler & Webner had in mind for the project, we performed a site survey and took some measurements. Based on the client’s vision, budget, and venue, we made some recommendations. They ended up going with a frosted acrylic panel sign with vinyl graphics. Using our innovative large format digital printer, we were able to perfectly capture their new logo and apply it to the 18” by 40” acrylic panel. Once the sign was fabricated, we worked with the firm’s scheduled to install it at a time that would cause the least disruption to business. We mounted the sign with spacers to make it stand off from the wall. In the end, the client was completely satisfied with their new signage! Acrylic panels are just one of the many different types of lobby signs available for your organization. Another popular solution is dimensional letters. These markers can be made of acrylic, sign foam, aluminum, PVC, or other materials. We use our router to cut the letters to match the fonts you use on your other marketing materials. This will assist you in your branding efforts. Cutting edge companies, such as tech firms, are turning to backlit lobby signs made of acrylic panels to give their reception area a sophisticated look. Backlit lobby signs use LED lighting, which lasts for up to ten years of continuous use and is extremely energy efficient. We can also install spotlighting in inconspicuous spots to draw attention to your lobby sign. The options are virtually limitless. If you are interested in welcoming clients into your suite while building your brand awareness, contact the friendly experts at Citrus Sign Studio today for a free consultation!